Planet Salem: the international Salem Al Fakir fansite! : Life will smile for you, unless you're Markus Larsson. Life will smile for you, unless you're Markus Larsson. 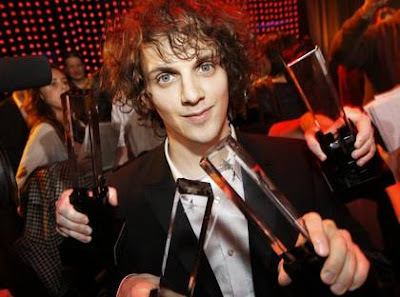 Not that we need an excuse for another picture of Salem and his four Swedish Grammys of course! Aww. Hope he's feeling better today. Anyway his victory on Wednesday night seems to have been received quite positively - but you can always rely on one dissenting voice to spoil the party. "It won't be no surprise..." that the dissenting voice is none other than Aftonbladet's music correspondent Markus Larsson, the man who last year achieved his five minutes of worldwide fame for giving the Rolling Stones gig a bad review only for Keith Richards to ask him for an apology. Following the Grammisgalan, Mr Larsson targeted Salem for one of his famous attacks, asking why someone who 'sings through his nose' should win 4 awards. Who said 'green-eyed monster'? How many awards have you won, Mr Larsson? Let me know.